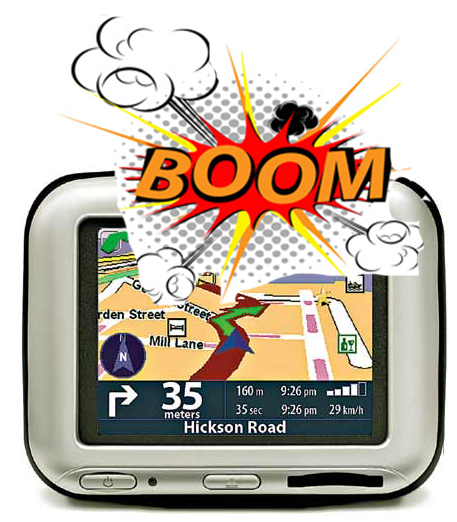 Sat Navs can be brilliant. They can also be incredibly irritating. They can also be dangerous, especially if you are a foreigner obeying instructions blindly. There are so many urban myths about truckers from Bulgaria ending up in the sea because they followed instructions to get to Gibraltar Point, which is several hundred yards off the Lincolnshire coats. There are also tales of bewildered elderly couples half way up a mountainside because they paid attention to the satnav rather than the road signs. But this week I watched as Da Boss managed to reduce a satnav to a quivering wreck, and all the while she had no idea what she was doing. It all started when we went down to London to see my sister. As we approached our destination Da Boss demanded that we stop at a supermarket to pick up flowers and wine as a thank you for putting a roof over our heads for the next day or so. The Satnav, which had been happily directing us to our destination, suddenly spotted that we were making a detour. “At the next junction turn right,” it chirped up happily. We turned left, in search of the supermarket. Da Boss was pretty sure that we were close by now. We carried straight on over the roundabout. “Turn Right at the first road!” squawked the Satnav. We turned left, still searching for this elusive Supermarket. “TURN ROUND!” screamed the Satnav. We carried on, by this time there were no signs at all of the supermarket. In fact we were now in a maze of small side streets somewhere a few miles from our original destination. By now the Satnav was really panicking. Things were not going right, in fact they were getting more and more wrong by the turn. ‘”Re-calculating route,” it announced somewhat shakily and then perked up once more. I was just about to follow this instruction when Da Boss spotted what she thought was a sign for the supermarket. I did as instructed, but kept an ear out for the Satnav. “Turn Right Please” came the next request. It had stopped being so bossy and now was pleading with us to pay attention to its directions. Okay, I made that last bit up, but I am sure that the Satnav was thinking something along those lines. By now the van we had been following had turned off into a builder’s yard and there was not a trace opf a supermarket in sight. I turned to Da Boss and said that it was perhaps time to head off to our destination, as our host would be waiting for us. The Satnav must have heard this for it perked up once again. I have no way of knowing what level of intelligence lies within that little black box that makes up the Satnav, but I am pretty certain that it has a quick peep to see if Da Boss is in the car before we set off on any journey. If it spots her then it takes the electronic equivalent of a stiff drink or perhaps a happy pill before it sets to work.